In geometry, a parallelogram is a quadrilateral with two sets of parallel sides. The opposite sides of a parallelogram are of equal length, and the opposite angles of a parallelogram are congruent. The three-dimensional counterpart of a parallelogram is a parallelepiped. The parallelogram must have 2 of the same size acute angles and 2 of the same size obtuse angles. * The two parallel sides are of equal length. * The area, A, of a parallelogram is A = BH, where B is the base of the parallelogram and H is its height. * The area of a parallelogram is twice the area of a triangle created by one of its diagonals. * The area is also equal to the magnitude of the vector cross product of two adjacent sides. * The diagonals of a parallelogram bisect each other. * It is possible to create a tessellation of a plane with any parallelogram. * The parallelogram is a special case of the trapezoid. * The rectangle is a special case of the parallelogram. * The rhombus is a special case of the parallelogram. In a vector space, addition of vectors is usually defined using the parallelogram law. The parallelogram law distinguishes Hilbert spaces from other Banach spaces. Since they are angles that a transversal makes with parallel lines AB and DC. Also, since they are a pair of vertical angles. Therefore, since they have the same angles. 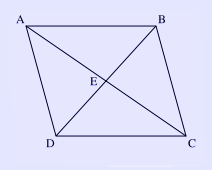 E bisects the diagonals AC and BD. Eric W. Weisstein, Parallelogram at MathWorld. Varignon and Wittenbauer Parallelograms by Antonio Gutierrez from "Geometry Step by Step from the Land of the Incas"
Van Aubel's theorem Quadrilateral with four squares by Antonio Gutierrez from "Geometry Step by Step from the Land of the Incas"